The concept of Ahimsa has been coming up frequently in my recent interactions with students. It's a very useful concept in the practice of yoga (both on and off the mat) and I'd like to take the opportunity to explore this concept with you. 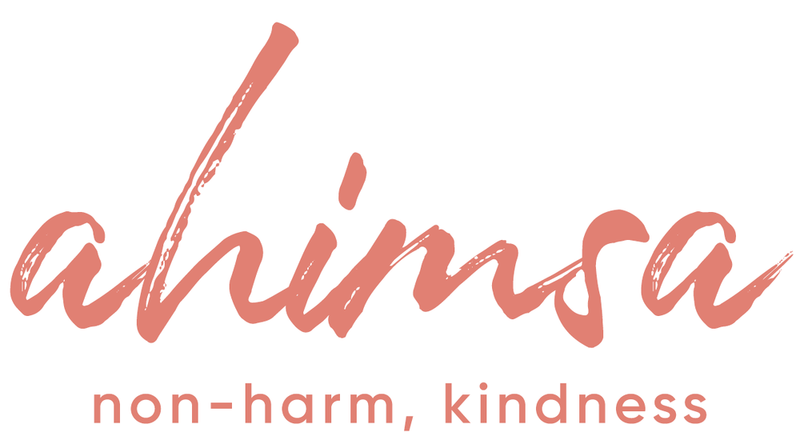 Ahimsa (ah-him-sah) is a Sanskrit word that means non-harm or kindness. We can think of ahimsa in an obvious way, like don't steal or don't hit. But the concept becomes much more interesting when we think about it at a subtle level. For example, during a pause in my Beginners Series class last week, a woman told me she was thirsty and asked if it's allowed to drink water during the yoga class. What do you think my response was? I told her about the concept of ahimsa, and how we should always be kind to our own bodies. Withholding water from a person who is thirsty causes them harm, so I told her that yes, she should definitely drink water if she is thirsty during class. And then, during my class for teenagers at RRISD last week, a boy complained that a yoga sequence hurt his body. It was a triangle pose sequence, and I saw that he was trying to stretch farther than was appropriate for him. I took that opportunity to teach my young students about ahimsa and explained that they should do all the āsanas in a way that's comfortable for their bodies. I think self-kindness a great lesson for young people. Today, as I listened to the tense and emotional testimony in the Kavanaugh Confirmation hearings, I realized that I myself was becoming tense and emotional. Listening to the testimony was causing me harm. Recognizing that fact was the first step in being kind to myself. Then I took an additional step of taking a break from the hearing and doing a short mid-afternoon conscious breathing practice to help calm my mind and my nervous system. We have countless opportunities every day to recognize our state and choose ahimsa. Stressful day? Take a nice soak in the bathtub. Grouchy kids? Send them to take a nice soak in the bathtub. Painful shoes? Get rid of them. Need to pee? Don't hold it, go pee. Hate your job? Start looking for a new one. We can also practice ahimsa with other people, and even the planet. Being kind to others is being kind to yourself. Allow cars to merge in front of you. Hold a door or elevator. How do you practice ahimsa in your life? Can you think of new, more subtle ways to practice ahimsa with yourself and others? Be Kind. All The Time. Something's been weighing on my heart this week. There's a boy in one of my kids classes who is usually kind of loud. He causes a good amount of disruption and I very frequently have to redirect his focus and bring him back to whatever lesson we're working on. Well this week, when we were working on some challenging poses, I realized he expressed doubt, uncertainty, and frustration every time I provided an instruction. He kept saying, "Ugh! I can't do that!" So, just as I do in all my classes, I asked him to be more kind with himself. I reminded him that it doesn't matter what the pose looks like, what's important is how it feels. I asked him to try *less* hard. I wanted him to find some ease. I wanted him to find a version of each posture that made him feel like he was doing a good job. He seemed to get the concept of being kind with himself, and he was able to do more poses without complaint. But every once in a while I'd hear, "Ugh! I can't do that!" So I'd gently remind him again to Be Kind with himself, not worry about what he thinks the pose is supposed to look like, and find a version that feels good for his body. A little later he suddenly said, "My dad says I'm not good at any sport. I've played a lot of sports and I'm not good at any of them." And my heart broke a little. I didn't know what to say. After a few minutes I asked him what sport he plays now. He told me he plays lacrosse. Then I asked him what does HE think he does well in lacrosse. He said that he thinks he's a good catcher. So I said, "Well, there you go! YOU are a good catcher in lacrosse! You ARE a good catcher in lacrosse! You are!" And I nodded and smiled to appear as convincing as possible. I told him to remember what makes him feel good about himself, and to not worry too much about what other people think. And this got me thinking about how almost everybody (myself included), even if we know better, sometimes we lose track of ourselves and we listen to the negative things people say about us. Without realizing what we're doing, we take those negative comments and adopt them as our truth. We start to believe the bad things. If we're lucky, we might have a moment of clarity and realize that the negative person is probably dealing with their own stuff, and their negative comment really doesn't have anything to do with us. But probably more often we hold on to those negative comments and allow them to hurt and damage us in a variety of ways. So I started to think about the yogic advice I gave this sweet boy: Be Kind. And I realized that we all need to Be Kind. All The Time. Be kind with ourselves. Be kind with others. Especially, Be Kind With Kids. Because we're forming their perception of themselves, and they deserve to love themselves. How can you Be Kind? Pay attention and notice what you do well and be proud and love yourself for doing those things well. Pay attention to what others do well and compliment them on the things they do well. I promise, this will make your whole life better. And I bet your kindness will rub off on other people and they'll want to Be Kind, too. As for the boy in my class, I realize now that the reason he was creating so much disruption was to distract me and his classmates from his perceived lack of ability in yoga. He was being a clown to avoid participating. But now I'm onto him. I'm going to Be Kind with him and, through yoga, I'm going to teach him how to Be Kind with himself. And I think that as he learns to Be Kind with himself, his behavior is going to change and he's going to be more focused during his practice. And I hope that over time, he'll become such an expert at Being Kind that when anyone tries to tell him something negative, it'll roll right off his back. P.S. When I told my friend Pichi about this story, she remembered this video she saw recently. You should check it out. It's perfect.